Only the SAEC Double Knife Edge design provides the optimum combination - a virtually frictionless pivot, free from extraneous movement. The SAEC WE-317S is a compact tone arm, suitable for any of today's standard-sized turntables. But it gives away nothing to longer arms.The same famous quality. Even greater rigidity and stability. 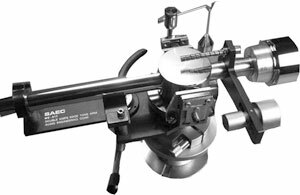 All in a heavy duty, easy to use tone arm. One that gives superb performance with a wide range of cartridges-light weight or heavy, high compliance or low. With any cartridge, you can be sure of perfect mechanical and electrical compatibility, and fully accurate and distortion-free tracking of any record. SAEC WE-317S / WE317 owners manual, service manuals and schematics are for reference only and the Vinyl Engine bears no responsibility for errors or other inaccuracies. The PDF files are provided under strict licence. Reproduction without prior permission or for financial gain is strictly prohibited. This website is not affiliated with or sponsored by SAEC. Posted Sat, 07/16/2011 - 11:45 by cacchew.